That's right theatre fans. One of this season's most highly anticipated new shows is now available at prices that can't be beat. 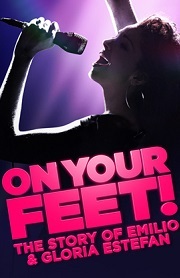 On Your Feet, which is based on the lives of Latin sensation Gloria Estefan and her husband Emilio, will begin previews at the Marquis Theatre on October 5, with opening night scheduled for November 5. Imagine that. A new musical that's not based on a movie or a book. Featuring such hit songs like "Get On Your Feet", "Conga", "Rhythm Is Going To Get You", and Coming Out Of The Dark", On Your Feet is one show you don't want to miss. Luckily for you, you don't have too. Why you ask? Because we sell tickets to the show. Plus if you call right now you can get tickets to see the show at some incredible savings. Be advised that while this "Insider Price" is good thru November 20, it is not good for Saturday evening performances and as always subject to availability. Get your tickets to see On Your Feet at the Marquis Theatre on Broadway. Until next time theatre fans.